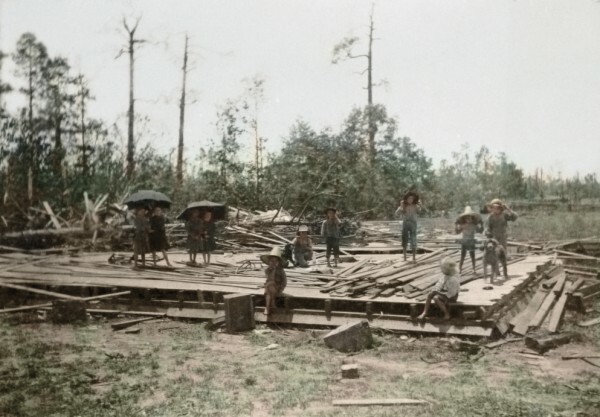 Home of James Hennesy and Nancy Caroline (Welch) Hennesy destroyed by a tornado 1909-1910. Stoney Point, Washington Parish, Louisiana. Quick touch of color to give definition. 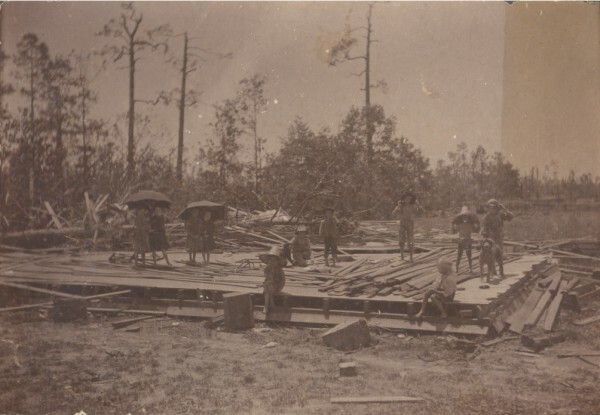 Ethel Hennesy identified this photo as possibly being of the home of James and Nancy Hennesy which was destroyed by a tornado in 1909-1910. Curtis Hennesy writes the home was instead destroyed in a 1912 tornado and was located between the Hennesy store at Stoney Point and Lular Hennesy’s house. There was no indication on the photo of photographer or date, nor any identification of the children. I wonder if Esmond, Jewel and Zula are among the children. I love the big, broad-brimmed straw hats protecting some of the children. The way all are wearing hats and a couple pairs huddle under umbrellas, it seems it might be drizzling but I’ve a hard time imagining a camera being taken out into the rain. The ground doesn’t like muddy and the boards don’t look wet. The sun appears to be out and high in the sky. 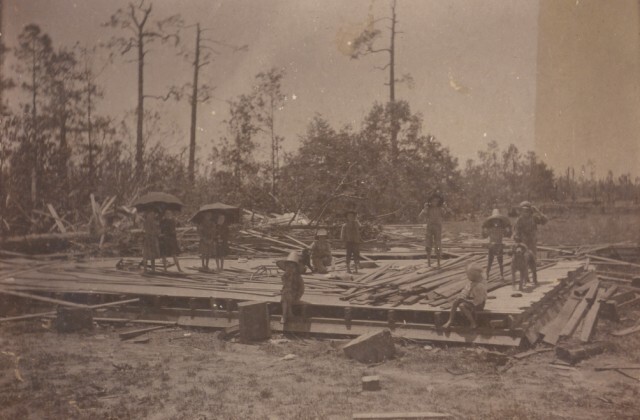 I’ve not news yet on a 1912 tornado but there was a terrible storm with a number of tornadoes that swept through several states in April 1908, including Louisiana, and devastated Amite City. Wikipedia has listed a tornado outbreak occurred April 20-29 in 1912 that also affected the southeastern states. Image from Ethel Simmons Hennesy’s collection.